A few weeks ago, I sat down once again on my bedroom floor. This time, with slightly less composure than I like to have for interviews. Crazy day at work, lost my climbing shoes (found them a week later thankfully) and about 5 minutes into our conversation (just enough time for me to barely collect myself), the battery died on my nerdy recording device. In the midst of all this Adam Finkel offered nothing but pure, genuine patience. My chat with Adam brought “tranquility” to my day as he put it. Adam Finkel is the man behind the ground breaking electronic project, Alek Fin. Originally from New Jersey, Adam now lives in the suburbs near LA, close to Newbury Park. He admits to needing the mountains, the fresh air and “some vitamin D so he doesn’t turn into a zombie.” In fact, after our chat, he was planning a hike in Newbury Park. Not long before we chatted, Alek Fin had released the newest single off of the upcoming An Mynda. This track, “Golden, Blinding” features the incredible talents of Moscow producer, Galun. This was the start of our conversation. Galun is extremely well known in Moscow and has mastered an incredible handle on using human vocals to create eccentric beats. MFL: How do you know Galun? MFL: That’s incredible. What a stroke of luck for both of you! AF: Yeah, it’s funny. I remember one time I was contacted from a label in Turkey in Istanbul and they were asking me to come out there to play a festival. For me, when you’re making music from small studios and home studios, it never ceases to amaze how far across the world it travels. I never thought anybody in Istanbul was listening to my electronic stuff. And he just said, “It’s like a message in a bottle. You never know where it’s going to land but it goes places you could never anticipate.” And I thought that was such a beautiful way to look at it. MFL: For you, where did you find your sound and style for electronic music? Are there any current or past musicians that you wanted to sound like or were inspired by? AF: I think something that Dave Cooley said that resonated with me because I can see a lot. He said, “Modern music is all about who can come up with the coolest idea now. You can join that group and make crazy songs, make the deepest bass that you can or, you can write songs.” After that conversation I had with him, I took a year off from writing. I went and listened to every album that everyone in your family told you was the greatest album ever made, ever since you were a kid…that you maybe heard one or two songs of but you never listened to the whole thing. Like Bruce Springsteen, The Beach Boys, Elvis Presley, or Willie Nelson. I just listened to all these records. I wasn’t like sitting there writing down formulas and calculating anything. It was just interesting to see why these are the greatest selling albums of all time. Why are they so catchy? Why are these melodies getting in your head? And that’s what makes them great and what makes them timeless. I don’t know if I’m going to sit and try to write something timeless or try to write a hit but I think at least noticing how things are structured and not trying to reinvent the wheel every time you write a track will just help people digest it a little better, you know? So that’s one approach I took. MFL: Did you distill anything from listening to these records? Find any common threads? Maybe it’s subjective and depends on who’s listening but for you personally or in general, did you notice anything you could take away? AF: Yeah, there were definitely a lot of things I noticed. I think melody is equally as important as having a clear focus. I think that when you’re making a mix, from an engineering perspective, there has to be a focal point. Most of the records I listened to, the vocals were the focal point and seeing how the melodies support the vocals and understanding what the lyrics are and hearing how the orchestration and composition really supports the words and the meaning of the title of the song is something I really took away and I realized that having a strong focus in your work of what you want people listening to and also having really clear intent behind that is what’s going to help people identify with what you’re trying to say and hopefully help the digest it. MFL: Have you, in the years that you’ve been writing and releasing music, have you ever had second thoughts and had it with everything. Wanted to throw in the towel? MFL: You said that you have a couple guys that play live with you? What are everyone’s roles when you play live? AF: The way that I chose to approach this project is a combination of three live shows that I’ve seen over the years. Basically, I want the human element to be present all the time. I feel like for this music it’s not quite house or trance where we can kind of let it just go on. I enjoy interacting with other humans on stage so it took us about 5 years to get it where it is right now but I’m so excited to finally have it ready. So the roles, Mike is the drummer so he plays a combination of live drum and electronic drums. I play guitar, bass, keyboards and I do all the vocals. And, Jeff handles the keys for a lot of tracks and also does a lot of the live sampling and looping and stuff like that. So we do a combination of live performance and for example for “Waiting Like a Wolf” I will play the guitar line and I have a trigger that will loop that line and it’ll play that back. So that that line is made on the spot but now I can go play keyboards and make other sounds. For me it’s just about being engaged as much as possible and being a part of the composition as its being made without just having to press buttons. The technology has finally caught up to make it possible for us to do it. MFL: When did playing live become something that you wanted to do? AF: I think I always wanted to do it. I think that’s why I do it at the end of the day. Hopefully bring people together and create an atmosphere where we’re all just experiencing the same thing in this moment together in some way. I just knew that even in the beginning that, I didn’t want to put it out there just to put it out there. I want to make sure that it would be something that I would want to go and see. I’ve been very selective about where and when we play up to this point because we’re kind of building this as we’re going and trying to decide what elements work and what don’t. We really wanted to make sure it was an experience and I knew then, too that I wanted it to be like going to a Sigur Rós show where you’re not just there to rock out, you’re there to experience a range of emotions. I think when I saw their documentary called “Heima”, I was like, “That’s what I want to do!” I want to go play in a giant abandoned fish tank in the middle of Reykjavik and go share music with people and make something that will just draw people from all over just come and sit in a room and just live together in that moment. That’s the end game here. I can’t help myself sometimes…I have to know the reason behind band names. Listen to our discussion below! MFL: So besides this EP release party, are you planning a tour for 2016 or anything? AF: The idea is that we’re going to be pretty active now. I think where were at at the moment is just taking it one day at a time. Before we start pushing other tour dates and locking things down, we are going to just get this EP release party figured out and get this EP out there and then once that’s locked, we’re going to be getting a lot of dates going. That’s definitely the plan, to get shows going and being more consistent, moving out and about a bit. Taking our show to some other cities and places and sharing the stuff! I then asked him about when and how music became part of his life. 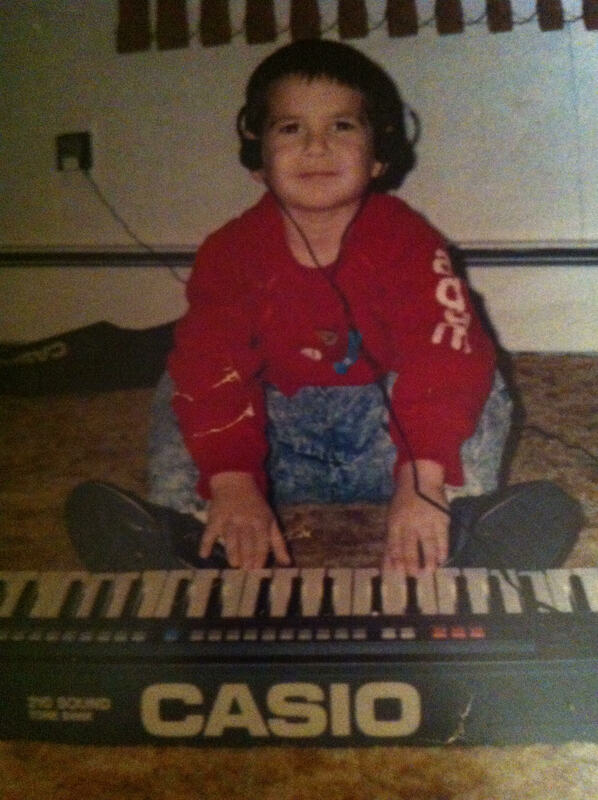 He mentioned an ancient photo of him when he was a kiddo, playing a CasioCT70…check it out! From there, he picked up saxophone then drums and later on in college, guitar. Listen to the rest of the story below as well. AF: You’ve written two really really passionate and awesome reviews for my work and I can’t thank you enough for that. And honestly Mull, that EP you’re listening to, no joke, I made that thing in a loft master bedroom in this house I was living in in Thousand Oaks. It was just me in there, I was recording my vocals, no vocal booth or lavish studio set up. It was just completely raw. I was using one tiny interface and one microphone to record all those drum samples and everything. It was completely DIY and I think Mull and “Waiting Like a Wolf” were a great testament to me. You can do this, you can break through the noise you absolutely can. Obviously, it’s about having the right people around you who can help you support it. I’m not discounting knowing the right people and networking and all this stuff I’ve done for years and the validation I’ve had form other opportunities. But that said, the product itself was made not too far off from where you are right now, I don’t think it’s the gear, I think it’s how you use it. Sometimes it’s cool, people think I work in multimillion dollar recording studios and I don’t challenge that. I don’t want to tell them it was recorded in my garage. No one wants to hear that. Well, some people do. I know there is a producer out there named Teebs who releases on Brainfeeder. Early on, I was reading he uses Fruit Loops. It’s like one of the first ever…it would come with your PC in the 90s and 2000s. I was like that’s in sane you’re using a fundamental recording software and his music is out of control beautiful. You don’t need all the biggest, most expensive gear in the world to make good stuff. That’s a load of garbage. You just need to build it with what you’ve got. So, here I am, working with what I’ve got: a tiny laptop, a recording device I found at work, and a dining room table to work at. Thank you Adam for your encouragement, time and thoughtful answers to all of my questions. Stay tuned for the release of his latest work, the An Mynda EP, which will be out this Friday, October 9th AND, his later project with Galun. Alek Fin is the musical namesake of the incredibly innovative and creative electronic musician, Adam Finkel. Not long ago, I posted about the first single he released, “Án Mynda.” This newest track, “Golden, Blinding” is equally as ingenious. It starts with a dark and brooding sound that maintains a steady wave that just rolls over you, pulling you under and not releasing until the very last beat. “Golden, Blinding” was a collaboration with Moscow-born electronic musician, Galun who frequently works with Alek Fin. “Golden, Blinding” will be featured on Alek Fin’s upcoming EP, An Mynda, which is due out October 9th. No one has heard a peep from Alek Fin in close to three years. The last we heard from him was when he released his debut EP, Mull, back in 2012 but we’re all very grateful for his musical reappearance Alek Fin is Adam Finkel, an electronic artist based out of LA.